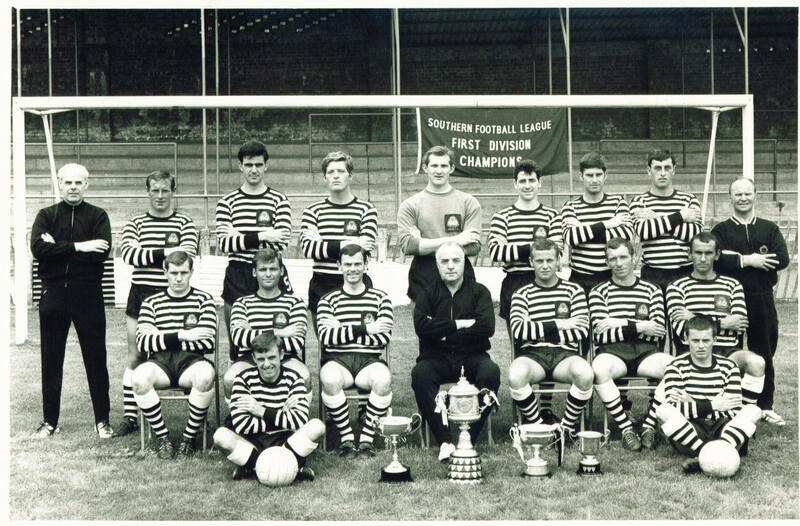 The team group from the start of the 1967-68 season, our first in the Premier Division of the Southern League. Back row (left to right): Jim Blaikie(Trainer), Brian Taylor, Bill Swain, Jim Ryan, Bill Price, Dave Peters, Alan Dennis, Chris Hurley, Les Steed(Assistant trainer). Middle row: John Langley, John Martin, Gerry Morgan, Bill Clover(Manager), Colin Clewlow, Robin Stepney, Johnny Ray. Front row: Micky Griffiths, Billy Stack.